FRIENDSWOOD — Recreational vehicles aren’t meant to have four people living in them for eight months — just ask the Eichberger family. The bathroom floor starts to cave in, the kitchen roof leaks every time it rains, and there just isn’t enough space for two boys and their parents to live comfortably. After Hurricane Harvey dealt the Texas coast a devastating blow on Aug. 25, 2017, it turned into a tropical storm that poured historic amounts of rain over several counties. Clear Creek, which runs 100 feet from the Eichbergers' back door, overflowed into the family’s Friendswood home, sending Jon and Kareen Eichberger fleeing through fast-moving water with their two youngest children. When they returned after the water subsided, the home that Jon, a truck driver, and Kareen, a national operations director for a nonprofit, built for their family in this Houston suburb had been virtually destroyed. “You get a different perspective when you lose everything you own,” said Kareen Eichberger, whose family finally moved out of the RV last month and into a house whose repairs are expected to continue until Christmas. Harvey was indiscriminate during its week of destruction. It submerged million-dollar Houston homes with its floods and blew apart mobile homes in Refugio with its 130-mph winds. Texans living in the massive disaster area, no matter their background, were thrust into a historic housing recovery effort rife with bureaucratic roadblocks, agonizing financial decisions and still-lingering anxieties. The storm caused more than $100 billion worth of property damage across 41,500 square miles. Since then, the Federal Emergency Management Agency and other agencies have approved more than $13.8 billion in disaster aid to 373,000 Texas households — out of more than 890,000 who applied. 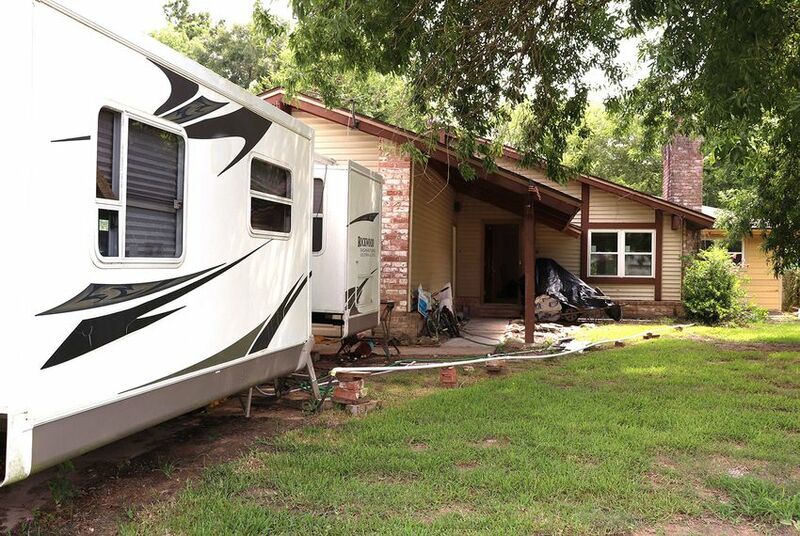 The Texas General Land Office, which is overseeing short- and long-term housing recovery efforts for the first time, helped more than 16,000 families with home repairs and provided more than 3,300 with recreational vehicles or mobile homes. It’s unclear how many families are still displaced. A year after Harvey, The Texas Tribune visited several families that have spent the past 12 months working to rebuild their homes and their lives. Some, like the Eichbergers, took on massive debt to rebuild. Others saw their dream of homeownership get washed away, just as it seemed to be within reach. And some wrestled with whether to pour the savings they’d amassed over decades back into homes they don’t trust the government to protect from future flooding. But many of Harvey’s victims said they’ve discovered a newfound faith in their fellow Texans through the tumultuous rebuilding, which will continue for years. 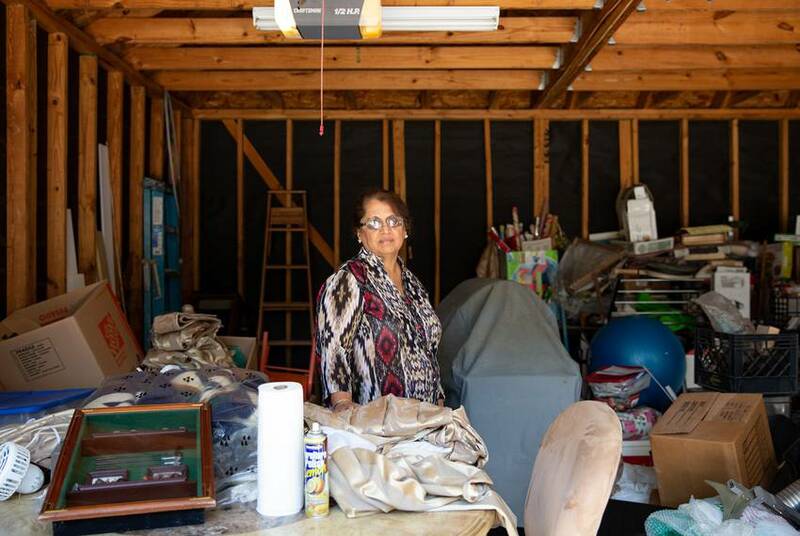 Living in a neighborhood that hadn’t had a substantial flood since the 1970s, Kareen Eichberger said she never thought to purchase flood insurance for their house. After it flooded, Jon and Kareen thought about selling but eventually decided that repairing the house was the best option to recoup some of their investment. This has left the family $119,000 in debt, even after $33,000 in FEMA assistance and an estimated $25,000 in donated supplies for the house. They have since purchased flood insurance. Still, Kareen sees the gutting of their one-story home as an opportunity to start over and “make it mine.” As the national director of operations at Genesys Works, she also took on the job of general contractor for the repairs while Jon quickly returned to his job as a truck driver for Safety-Kleen. Kareen said her master’s degree in business prepared her to sort through the mass of FEMA documents and applications that had to be completed. Within 24 hours of the flood, Kareen was on FEMA’s website applying for disaster recovery assistance. “I remember thinking that if you only had a high school degree or less education, how difficult that would be to work through,” she said. Kareen said donations, volunteers and well wishes have arrived in droves during the year since Harvey. People from as far away as Tennessee traveled to Friendswood to assist with the repairs to the Eichbergers’ house. Their two eldest children — Aubrie, 20, and Anthony, 21 — had already moved out on their own. The two youngest — Aiden, 13, and Ashton, 9 — found themselves cooped up in the RV except when they went to school or took bike rides around their flood-ravaged neighborhood. Luckily, Aiden and Ashton saved their Xbox and tablets from the floodwaters by tossing them in the attic. 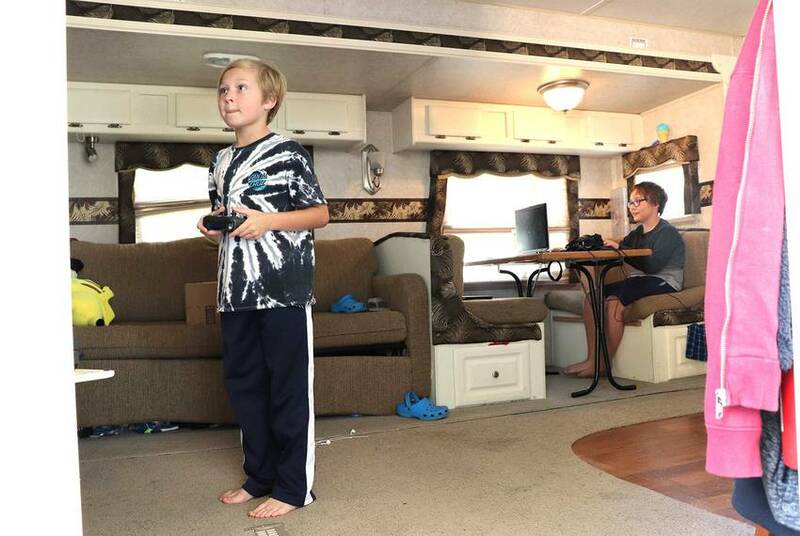 The Xbox kept the boys occupied during long summer days in the RV while their parents worked to return life to normal. Kareen has grown to dislike the RV as much as her sons. After they moved back into the house, she gave her husband an ultimatum: “He has 60 days to sell it, or I’m lighting it on fire,” Kareen said. For Kareen and Jon, the seemingly endless home repairs and days in the overcrowded RV are manageable when they think about how bad things could have been. As Harvey’s floodwaters rose around them last year, Kareen and Jon carried Aiden and Ashton out of the house to a police boat. When Kareen, who was carrying Ashton, stepped away from the house and into faster-moving water, she was swept off her feet, and her son was pulled from her grip. If it wasn’t for the quick reactions of an officer who plucked Ashton from the water by the back of his shirt, Kareen thinks she never would have seen her son again. Across the wide swath of coastal Texas ravaged by Harvey, an estimated 94 people lost their lives during and after the storm. Kamal and Shammi Bajaj’s home has come a long way since sitting in the middle of a lake. Most of the repairs on the house, situated in the northwestern Houston neighborhood of Twin Lakes, are completed. But the couple says local and federal agencies haven’t done nearly enough to make sure flooding like this never happens again. Twin Lakes was one of many neighborhoods built within the designated flood zones of Addicks and nearby Barker reservoirs. But because the homes were built outside the 100-year floodplain, homeowners weren't required to buy flood insurance — and most said they were unaware they were living inside the reservoirs' flood zones. As the reservoirs swelled under Harvey’s heavy rains — protecting downtown Houston and thousands of homes downstream — the water inundated upstream neighborhoods like Twin Lakes. They finished a majority of repairs to their two-story home by January, but it cost them $100,000 on top of about $17,000 they received from the federal government. Kamal and Shammi both said they feel lucky to be in the position to afford the repairs, but now that the house has flooded, they’re considering selling it. The Bajajs aren’t planning on joining many of their neighbors in lawsuits against the Army Corps of Engineers, which built and maintains the reservoir, but they do feel they deserve to be compensated. Kamal also said the couple would be open to a government buyout. “If we sell the house, how do we know this won’t happen again to the next people?” Shammi Bajaj said. The couple just wants to be sure a flood on this scale will never happen again in Houston. “There are people in this city who live paycheck to paycheck and can’t afford to move back into their home and make the payments that we did,” Kamal said. Christy Combs, her husband and her four kids barely escaped Aransas Pass as Harvey made landfall in nearby Rockport the night of Aug. 25. 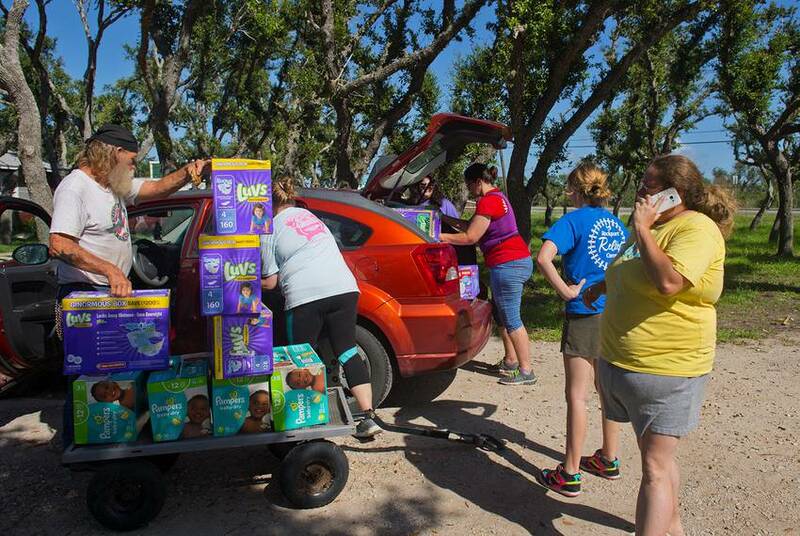 As the storm approached that afternoon, the Combs family was speeding away from the Texas coast, crammed into a truck with nearly 300,000 miles on it that shook from increasingly powerful wind gusts. A year later, the family is still recovering from the storm that destroyed their apartment, along with most of their belongings. Combs said the family struggled to apply for temporary housing through FEMA because they have two service dogs — one assists Combs with her epilepsy and another helps Combs’ daughter with her autism. Both dogs are pit bulls, and Combs said because the paperwork proving their service dog status was destroyed by the storm, most hotels and apartment complexes wouldn’t rent to the family. The restaurant where Combs worked as a waitress before the storm was shut down for a month, and she said the family received only $526 from FEMA, leaving them struggling in Harvey’s aftermath. 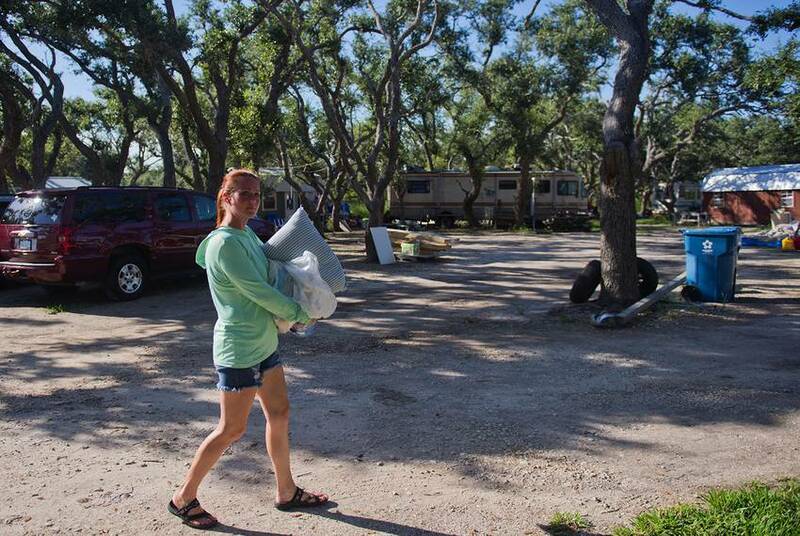 Eventually, the family ended up in Rockport, where Samantha McCrary’s 3.5-acre property on the edge of town has served as a refuge for hundreds left homeless after the storm. McCrary’s house avoided any lasting damage, but in the year following the storm, she has worked nearly every day to distribute donated food and supplies to people still grappling with their own recovery. What started as a generous public service quickly turned into a full-time job when she opened her land to people without anywhere else to stay, naming it the Rockport Relief Camp and obtaining nonprofit status. McCrary owns a catering business called Mermaid’s Kitchen, which she ran from a waterfront building that was flattened by Harvey’s Category 4 winds. She was able to recover some cooking supplies from the wreckage, but she wasn’t prepared for the hundreds of people who came to her makeshift camp every day for food — or the surge of donated, food, money and supplies she received from around the country after she appeared on national TV and word spread about her operation. The camp quickly ballooned to 100 residents sleeping in RVs and tents while they sought more permanent shelter, and McCrary — with the help of family and a growing group of volunteers — estimates she was serving up to 1,500 meals a day out of a long tent in her yard at the camp’s peak. FEMA says it has delivered $117 million in aid to Rockport residents as of Aug. 7. Rockport, like many coastal towns, is divided between the wealthier beach house owners and the service-industry workers who keep the 10,000-person community running, McCrary said. While many of the wealthy areas were able to quickly recover, McCrary said many of the poorer neighborhoods still are struggling nearly a year later. That means McCrary’s work isn’t done. She still hands out donated supplies twice a week to people who arrive on her property looking for help. While the population of the camp has dwindled to only a handful, those who remain are considered part of the family. One of them is Combs, who still lives with her family in an RV at McCrary’s camp a year after Harvey. She’s left her old job as a waitress and taken on a role as the emergency management coordinator for McCrary’s nonprofit while her husband works a full-time job in construction. “We still get people who just hug us and thank us for still being open and here to help when everyone else has packed up and left,” she said.